Remove safety hazards and discourage rodents with the cleaning that is taught in the Interior Cleaning training. 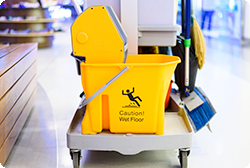 This online training module teaches the correct process for sweeping and mopping floors, cleaning hard to reach areas, and alerting customers about wet floors. Employees are taught the importance of being vigilant about cleanliness and how it impacts business.